Costa Rica put the red in [in 1848] to differentiate it from the other three with the horizontal blue stripes; Guatemala turned the stripes and made them vertical. At one time in the 19th century Costa Rica used blue flag with a thin white cross with a red canton and several stars (no clue as to the number). According to Smith's "Flags Through the Ages and Across the World" [smi75b] - Honduras entry (page 241): "The blue-white-blue horizontal striped flag of the United Provinces of the Center of America, based on the Argentine flag, was first hoisted in the independence struggle against Spain on 4 July 1818, when the commodore of the Argentine squadron, Louis Aury, proclaimed the first independent Central American state on islands off the eastern coast of Nicaragua. Aury's government lasted until 1821......(in 1823) when complete independence was established the new national flag had stripes similar to, and apparently based on, those of the first free state.."
The blue and white colours where also adopted in Central America. The first flag is said to have been created by Colonel Arce on 20 February 1822 and presented to a unit from El Salvador going off to fight the Mexicans, who had annexed the central provinces. When the United Provinces of Central America were set up, the same flag was adopted on 21 August 1823. [...]"
So, although it doesn't seem to be firmly established, it is very likely that the Central American colours come in fact from Belgrano's flag, through Louis Aury's (a french name?) expedition in 1816 and 6 years later through Colonel Arce, who could have had contact with Louis Aury's people in between (or even be one of them!). Further, given the fact that all south american symbology is positively embroided in masonic symbology, this influence could have gone also through masonic channels. My speculation here. 275 Central America - Blue over white over blue, in the centre a blue disk. Laurie's flag book of 1842 has an important caption under the same flag that was ignored by all copyists and by some vexollologists. It reads: "Arms in the center or the words Dios Union Libertad." - 15 September 1821 - Independence of the colonial "Kingdom of Guatemala" (Costa Rica, El Salvador, Guatemala, Honduras, Nicaragua and Chiapas). - 5 January 1822 - Incorporation into Mexico. - 11 January 1822-10 Febuary 1823 - El Salvador in secession. - 1 July 1823 - Independence again (Costa Rica, El Salvador, Guatemala,Honduras, and Nicaragua). - 10 Jul 1823- United Provinces of the Centre of America (also styled Republic of the Centre of America). - 10 April 1825 - Federal Republic of Central America. - 1838 - Nicaragua, Costa Rica, and Honduras exit the Federation. - 17 April 1839 - Guatemala exits the Federation. - 17 July 1842-1 December 1844 - Abortive attempt to restore Confederation of Central America (El Salvador, Guatemala [withdraws], Honduras, and Nicaragua). - 13 October 1852-10 November 1852 - Abortive attempt to restore the Confederation of Central America (El Salvador, Honduras, Nicaragua). - 1898-30 November 1898 - Abortive attempt to restore the Central American federation, Republic of Greater Central America (El Salvador, Honduras, Nicaragua). - 13 June 1921-14 January 1922 - Federation of Central America (El Salvador, Guatemala, Honduras). - 14 January 1922 - Guatemala leaves the federation. - 4 Febuary 1922 - El Salvador leaves the federation. - 7 Febuary 1922 - Honduras officially leaves the federation. No. 833 - Central America. The flags of Honduras, Nicaragua, El Salvador and Costa Rica are all based on the blue-white-blue tricolour of the United States of Central America, which was dissolved 1838-9. Rica went on to establish themselves as the United Provinces of Central America on July 1, 1823. The flag with B.N. was a military flag. B.N. meaning Batallon Nacional. Central American Federation - The flag and the emblem that was used in 1824. I found this web page that actually has a copy of the original constitution in 1824 with a picture of the coat of arms. <www.tulane.edu/~latinlib> (defunct). From <www.infoplease.com>: "Central American Federation or Central American Union, political confederation (182538) of the republics of Central America: Costa Rica, Guatemala, Honduras, Nicaragua, and Salvador. United under a captaincy general in Spanish colonial times, they gained independence in 1821 and were briefly annexed to the Mexican empire formed by Agustín de Iturbide. Flags - The 2nd of April of 1851, the National Diet, with seat in Leon, Nicaragua, created by the Pact of Leon in 1849, decreed obligatory the Flag of the Centralamerican Federation, composed of two blue stripes and a white one in the center, with the coat of arms, for the Republic integrated by Honduras, El Salvador and Nicaragua. Coat of Arms - The National Diet that was based in Leon, Nicaragua, and on the 22 of April of 1851 decreed the Shield of Arms of the three Republics: El Salvador, Honduras and Nicaragua. The President of the Diet was Don Hermenejildo Zepeda and Secretary Don Pablo Buitrago, the design contained the following figures: An equilateral triangle in whose base there is a mountain range with three volcanos, those that symbolize the three nations united by the Pact of Leon celebrated in 1849. The volcanos rise both on a land bathed by the oceans. Over the volcanos, a rainbow; underneath the rainbow, the cap of Freedom " spreading lights ". In the superior part, three stars. 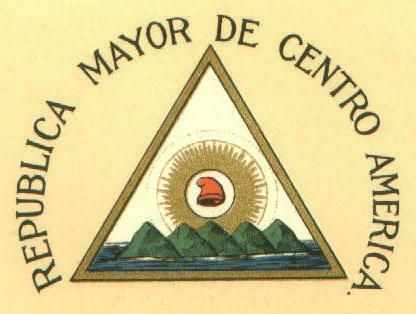 Limiting the triangle and in a semicircle, the inscription CENTRALAMERICAN FEDERATION. The Greater Republic of Central America, composed by El Salvador, Honduras and Nicaragua, as a result of the Pact of Amapala signed in June of 1895, adopted the Flag of 1851 with two blue strips and one white in the center, and hoisted the 1st of November of 1898. Due to the events of the 21 of November of 1898, these ended the Greater Republic. The Greater Republic of Central America, born in 1896 and formed by El Salvador, Honduras and Nicaragua, adopted the same Shield of Arms decreed by the National Diet of Chinandega, Nicaragua in May of 1851 but removing the three stars and adding two volcanos and limiting the triangle and in a semicircle, the inscription GREATER REPUBLIC OF CENTRAL AMERICA. No. 866 - Central America containing Honduras, Nicaragua and San Salvador (1847) [the blue ball must be in fact the arms]. NB. Also with Dios, Union, Libertad on the ball.